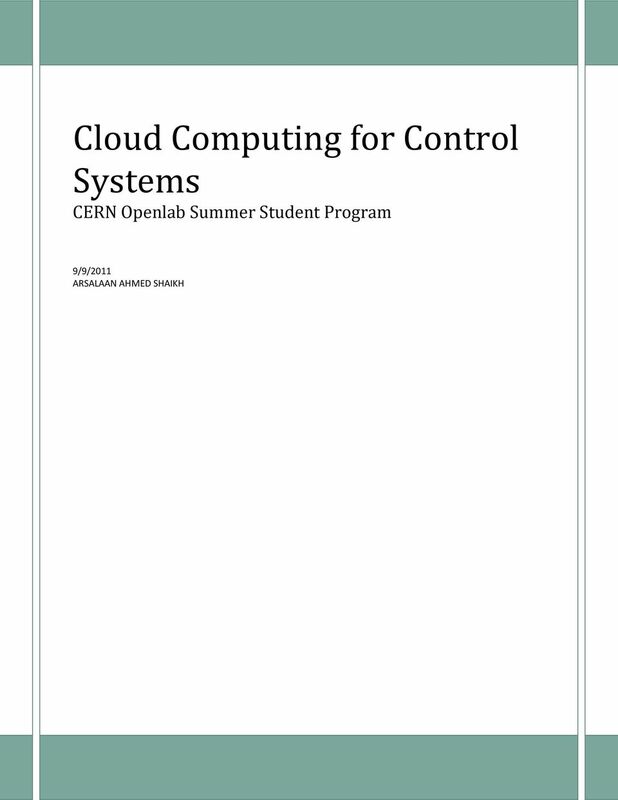 Download "Cloud Computing for Control Systems CERN Openlab Summer Student Program 9/9/2011 ARSALAAN AHMED SHAIKH"
4 INTRODUCTION The project Cloud Computing for Control Systems aimed to design and configure a complete private cloud infrastructure for control system applications. The aim of the project is to enable small scale teams to setup test environments for development and experimentation purposes. Cloud technology enables virtualization of multiple operating systems as independent software applications. Virtualization was introduced as early as the 1960 s by IBM, enabling users to execute their applications simultaneous as well as independently. Since its early days the technology has evolved, allowing the virtual instances to run in privileged mode and access the underlying hardware directly. Cloud computing has taken this technology to enable enterprise level deployments of virtual machines and better utilization of vast resources such as data centers. The motivation behind the project is the wide user community at CERN, which comprises of development, test and operational teams. Virtualization managed by management software which is the cloud technology facilitates rapid development. The commercial success of Amazon cloud and other such enterprise solutions has motivated the open source community, which in turn has provided solutions such as Eucalyptus, OpenStack and OpenNebula. Out of the three OpenNebula was selected as the cloud technology for this project as it fulfilled the requirement of supporting hypervisors for both linux and windows operating systems. In addition to that the user friendliness and easy to manage capabilities were also contributing factors in the decision. The hardware used for the project is HP Proliant 380 G4 machines with 8 gigabytes of main memory, 500 gigabyte secondary storage. The machines were connected to high bandwidth network connections. SYSTEM COMPONENTS The project contains many components the four major components are OpenNebula Cloud Management Toolkit, VMware ESX Hypervisor, OpenStack Image Registry and Delivery Service(Glance) and Instance Management Agent. 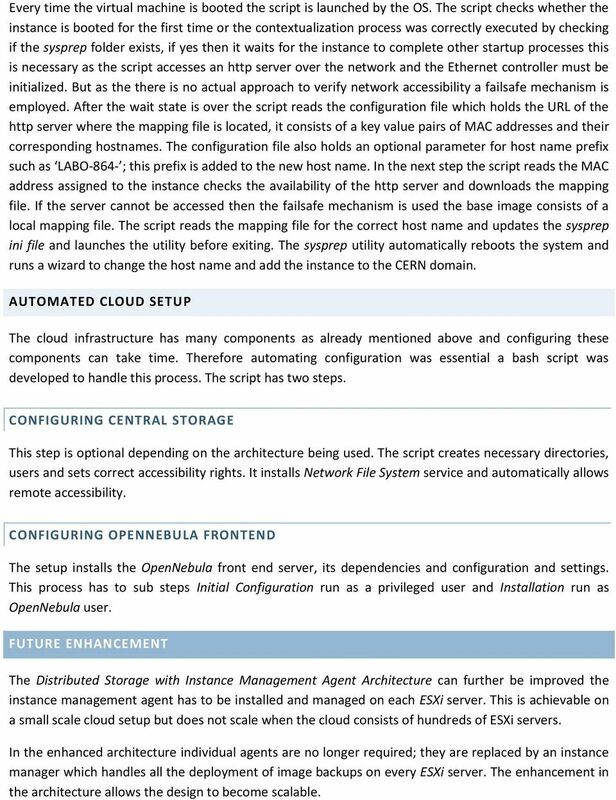 OPENNEBULA CLOUD MANAGEMENT TOOLKIT OpenNebula is an IaaS (Infrastructure as a Service) open source solution which allows building private, public and hybrid clouds. It has been designed to be able to integrate with any kind of network or storage system and supports the main types of hypervisors: KVM, VMware and XEN. 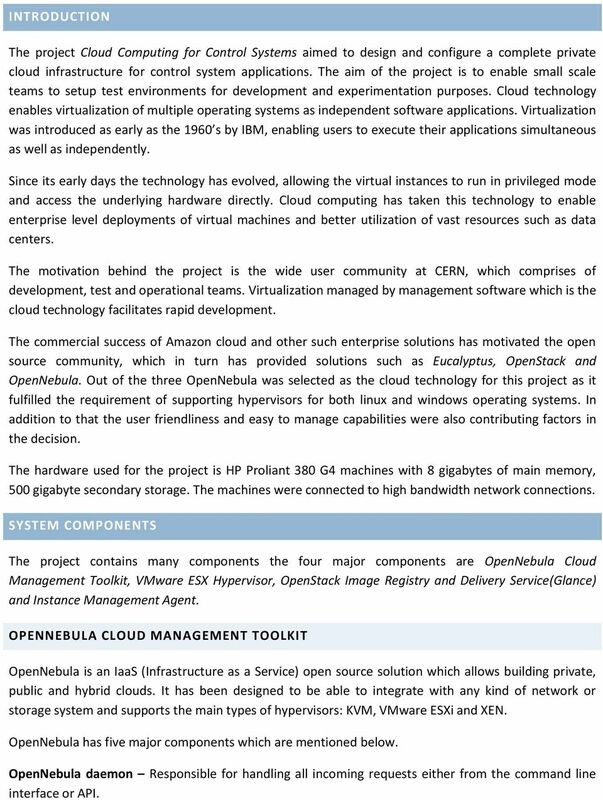 OpenNebula has five major components which are mentioned below. OpenNebula daemon Responsible for handling all incoming requests either from the command line interface or API. 6 service and HTTP. Glance Registry Server is the second component it is a web service that adheres to the Glance RESTful API for image metadata. INSTANCE MANAGEMENT AGENT Instance management agent is a software component developed in this project as additional management service that resides inside each of the hypervisors it clones a predefined number of images on the node. It is an enhancement to the ssh based distributed storage architecture used in OpenNebula, it provides fast deployment of instances. This component will be explained in detail later. 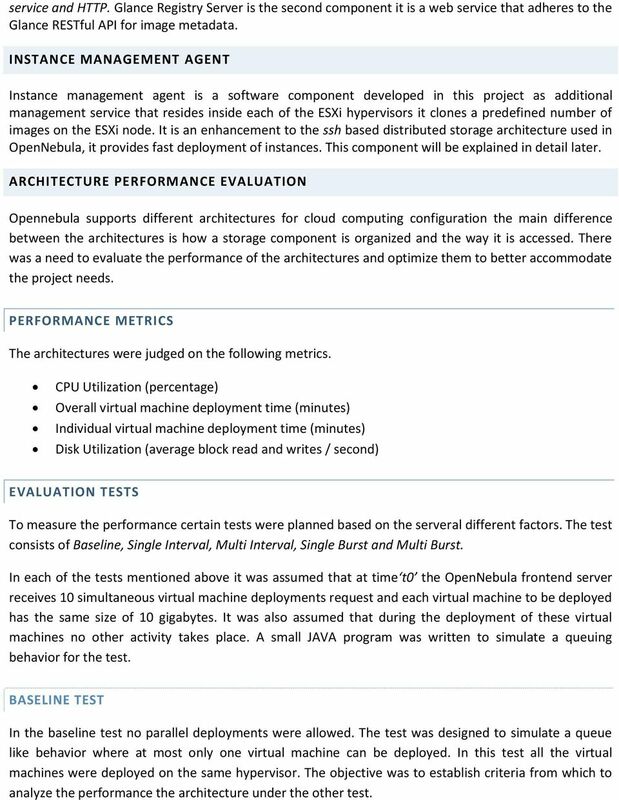 ARCHITECTURE PERFORMANCE EVALUATION Opennebula supports different architectures for cloud computing configuration the main difference between the architectures is how a storage component is organized and the way it is accessed. There was a need to evaluate the performance of the architectures and optimize them to better accommodate the project needs. PERFORMANCE METRICS The architectures were judged on the following metrics. CPU Utilization (percentage) Overall virtual machine deployment time (minutes) Individual virtual machine deployment time (minutes) Disk Utilization (average block read and writes / second) EVALUATION TESTS To measure the performance certain tests were planned based on the serveral different factors. The test consists of Baseline, Single Interval, Multi Interval, Single Burst and Multi Burst. In each of the tests mentioned above it was assumed that at time t0 the OpenNebula frontend server receives 10 simultaneous virtual machine deployments request and each virtual machine to be deployed has the same size of 10 gigabytes. It was also assumed that during the deployment of these virtual machines no other activity takes place. A small JAVA program was written to simulate a queuing behavior for the test. BASELINE TEST In the baseline test no parallel deployments were allowed. The test was designed to simulate a queue like behavior where at most only one virtual machine can be deployed. 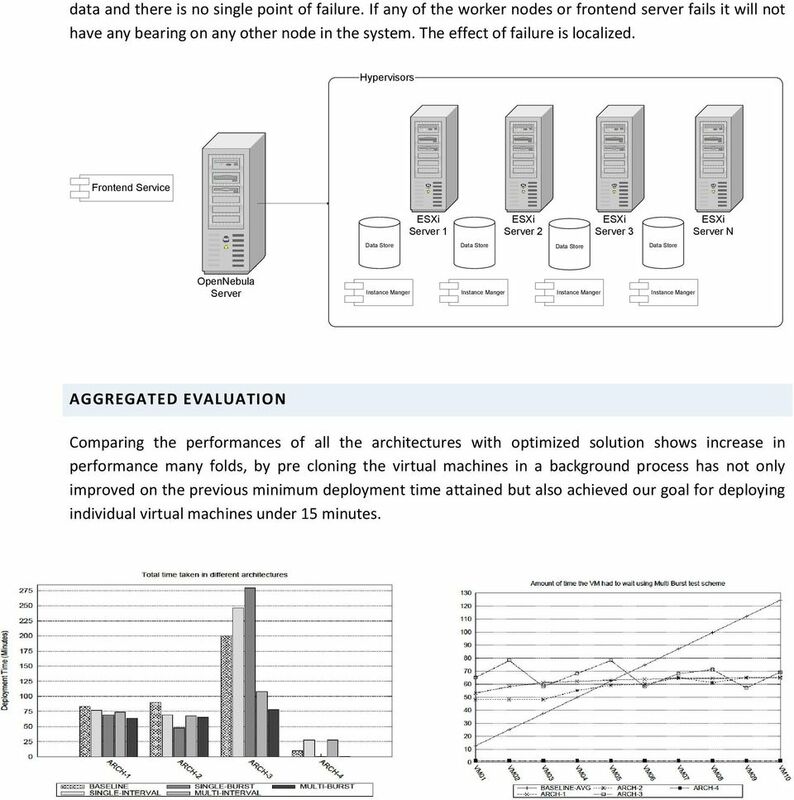 In this test all the virtual machines were deployed on the same hypervisor. The objective was to establish criteria from which to analyze the performance the architecture under the other test. 7 SINGLE & MULTI INTERVAL TEST In single interval the all virtual machines were deployed on a single hypervisor, hence the word single in the name of the test. The test simulates a queue but also allows a degree of concurrent deployments. As assumed the system receives 10 simultaneous deployment requests and test adds them to a queue. 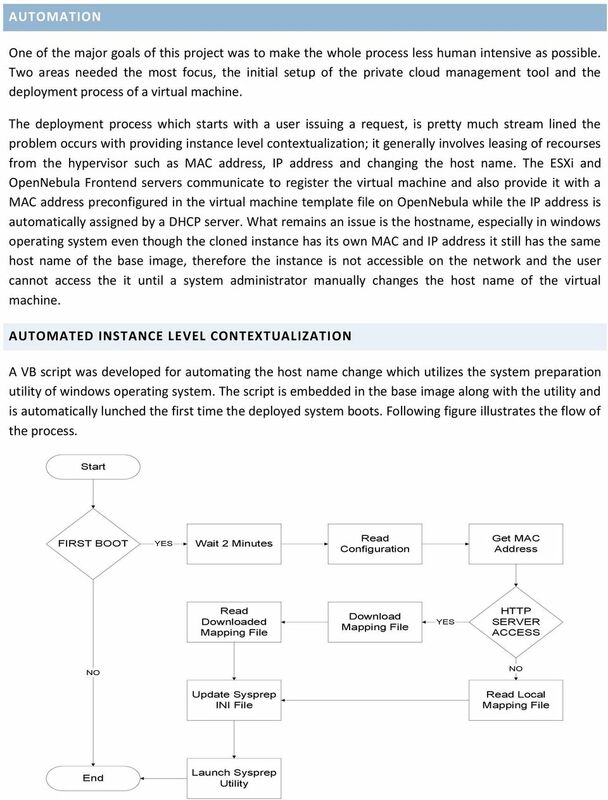 Each virtual machine is deployed after the lapse of a predetermined interval in time. In the case of the tests conducted the interval selected was of three minutes. Multi interval test was designed to mirror the functionality of single interval; the only difference between the two was that multi interval equally distributed the virtual machines on to three hypervisors. SINGLE & MULTI BURST TEST In burst test there is no queuing mechanism employed, all deployment requests are executed at the same instant they are received. In assumption that all 10 requests were received at t0 therefore all deployments commands were executed. The tests differentiate on the basis of the number of hypervisors involved, one in the case of Single Burst and three in the case of Multi Burst. CLOUD ARCHITECTURE As mentioned earlier one of the important objectives of this project was to not just setup a cloud infrastructure but to thoroughly study different architectures and their performance. Components in a cloud are loosely coupled and can be manipulated to fit different architectures suiting the existing infrastructure. Under this project three basic architectures were implemented and experiments were conducted over them to understand their advantages and disadvantage and after analyzing the results a few components were developed to enhance the capability and performance according to pre existing hardware. Following are the architectures that were implemented: NFS Based Central Storage Architecture (Frontend and Data Server on Separate Machines) NFS Based Central Storage Architecture (Frontend and Data Server on Same Machines) SSH Based Distributed Storage Architecture NFS BASED CENTRAL SHARED STORAGE ARCHITECTURE (FRONTEND AND DATA SERVER ON SEPARATE MACHINES) In this architecture a separate server is used for data storage, the data storage server is the main point of all communication, all the worker nodes as well as the frontend server must have the server drive mounted. 9 Baseline performed poorly overall, but up to the seventh deployment it has the most VMs that are ready for usage while at the same instant of time intervals tests only 3 VMs and burst test have 0 VMs ready for usage. 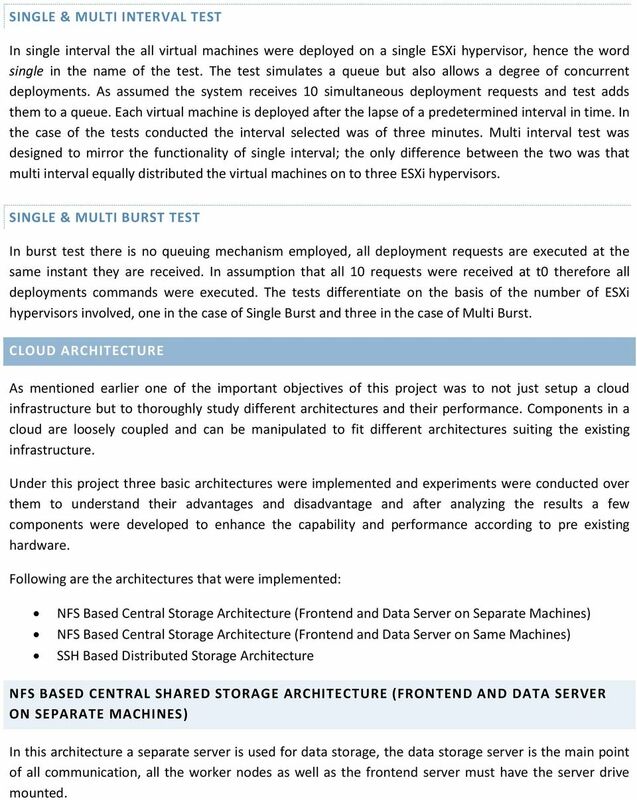 None of the tests achieve minimum criteria of performance which was set at maximum 15 minutes of a single machine deployment apart from VM1 in baseline test. NFS BASED CENTRAL SHARED STORAGE (FRONTEND AND DATA SERVER ON SAME MACHINE) In the second variant of the central storage architecture the frontend and data services reside on the same machine. The worker nodes access the OpenNebula server by mapping the NFS drive and using the NFS communication protocol. This architecture drastically increases the risk of single point of failure, as now the OpenNebula server becomes the focal point of communication. All the advantages gained in the previous architecture are lost. The time to recover the frontend server amplifies and if backup of the data repositories are not taken then there are chances of data loss. Any failure to the OpenNebula server will directly affect the users of the virtual machines. 10 Hypervisors Frontend Service Data Store OpenNebula Server Server 1 Server 2 Server 3 Server N Even though this architecture has serious problems, it does has some advantages the cloning process while deploying a virtual machine which is the most time consuming part is reduced due to no network overhead due to which the deployment time of virtual machine decreases, in addition to that there is no unnecessary bandwidth consumption. 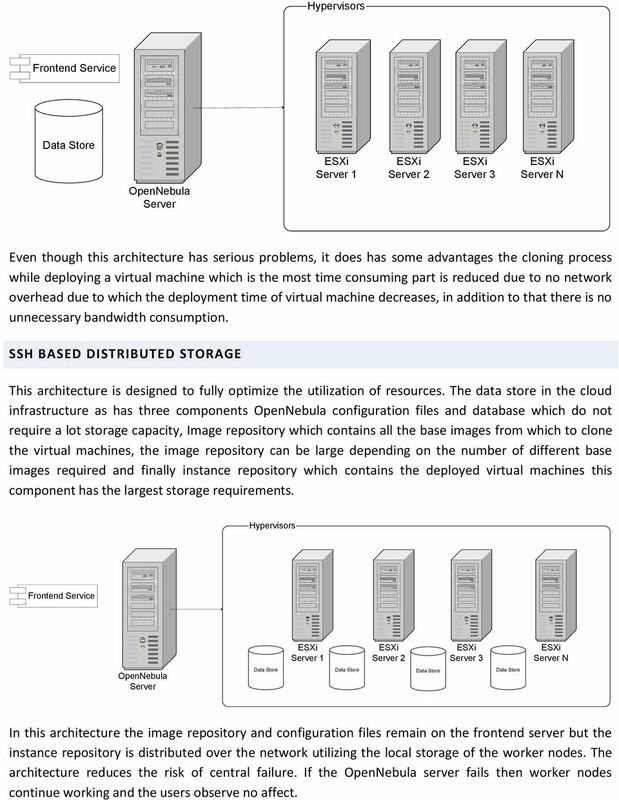 SSH BASED DISTRIBUTED STORAGE This architecture is designed to fully optimize the utilization of resources. The data store in the cloud infrastructure as has three components OpenNebula configuration files and database which do not require a lot storage capacity, Image repository which contains all the base images from which to clone the virtual machines, the image repository can be large depending on the number of different base images required and finally instance repository which contains the deployed virtual machines this component has the largest storage requirements. 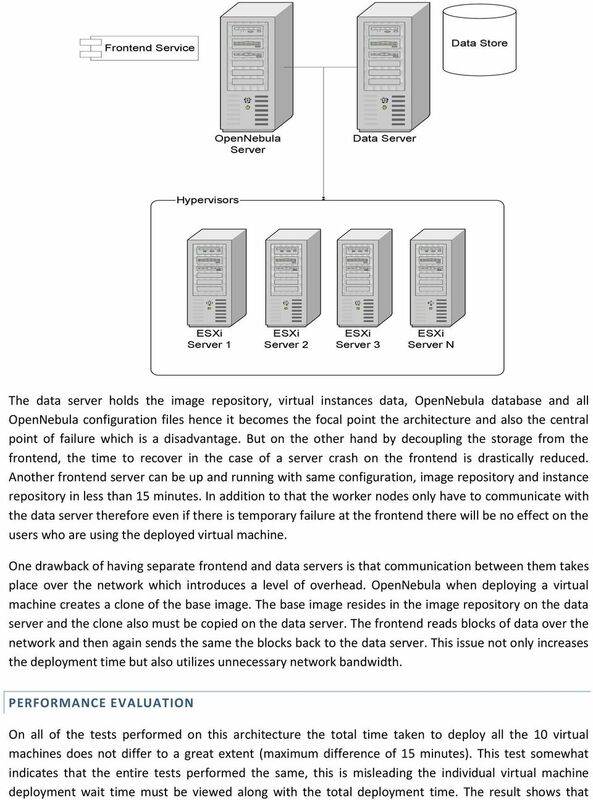 Hypervisors Frontend Service OpenNebula Server Server 1 Server 2 Server 3 Data Store Data Store Data Store Data Store Server N In this architecture the image repository and configuration files remain on the frontend server but the instance repository is distributed over the network utilizing the local storage of the worker nodes. The architecture reduces the risk of central failure. If the OpenNebula server fails then worker nodes continue working and the users observe no affect. 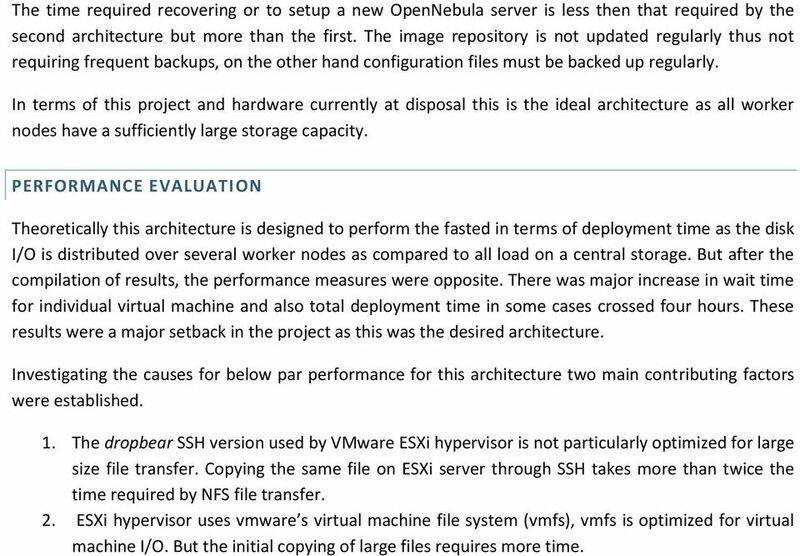 11 The time required recovering or to setup a new OpenNebula server is less then that required by the second architecture but more than the first. The image repository is not updated regularly thus not requiring frequent backups, on the other hand configuration files must be backed up regularly. In terms of this project and hardware currently at disposal this is the ideal architecture as all worker nodes have a sufficiently large storage capacity. 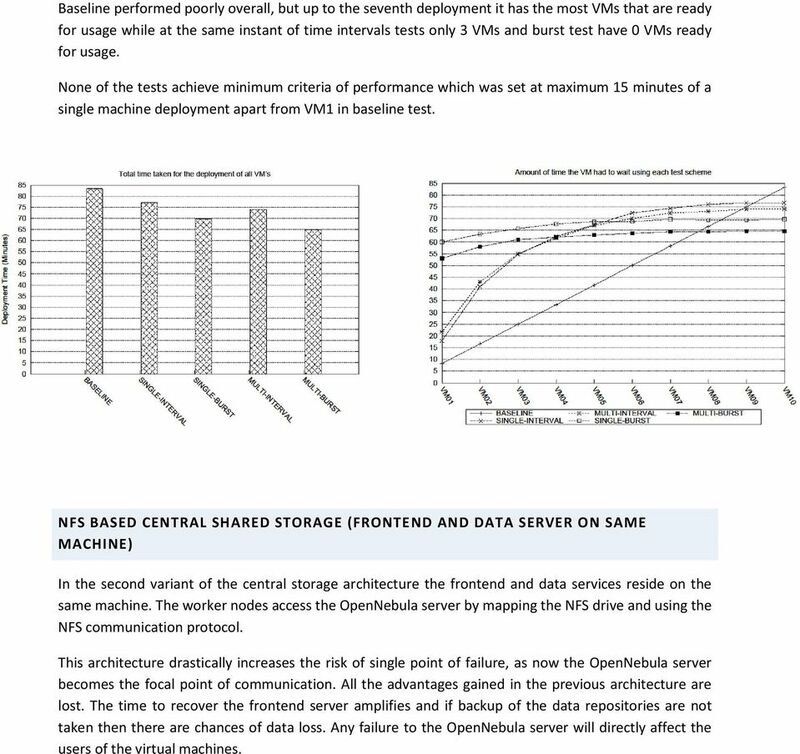 PERFORMANCE EVALUATION Theoretically this architecture is designed to perform the fasted in terms of deployment time as the disk I/O is distributed over several worker nodes as compared to all load on a central storage. But after the compilation of results, the performance measures were opposite. There was major increase in wait time for individual virtual machine and also total deployment time in some cases crossed four hours. These results were a major setback in the project as this was the desired architecture. Investigating the causes for below par performance for this architecture two main contributing factors were established. 1. The dropbear SSH version used by VMware hypervisor is not particularly optimized for large size file transfer. Copying the same file on server through SSH takes more than twice the time required by NFS file transfer. 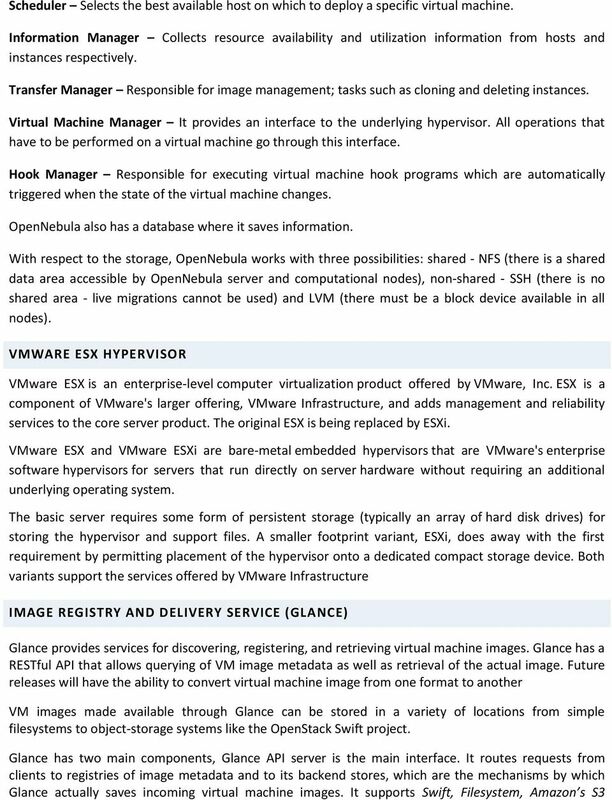 2. hypervisor uses vmware s virtual machine file system (vmfs), vmfs is optimized for virtual machine I/O. But the initial copying of large files requires more time. 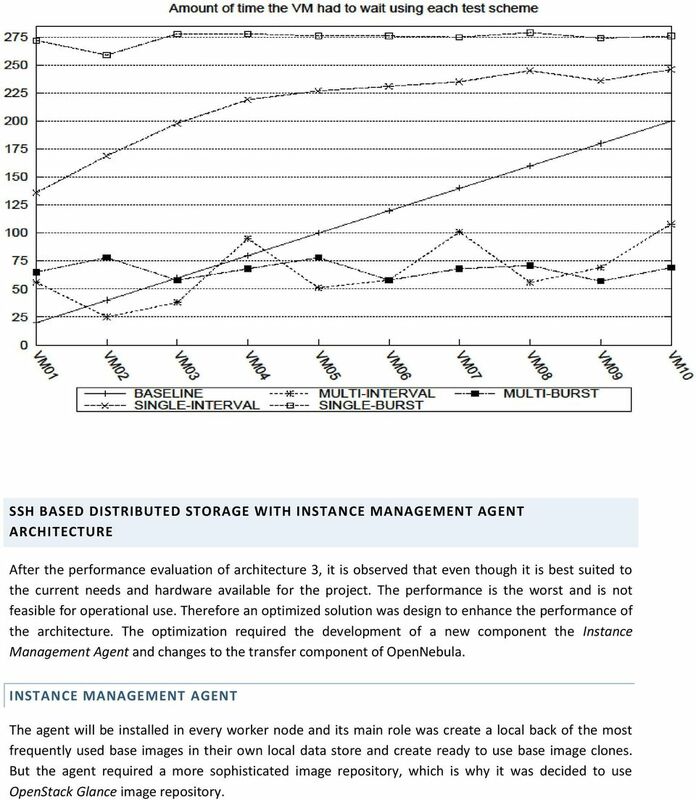 12 SSH BASED DISTRIBUTED STORAGE WITH INSTANCE MANAGEMENT AGENT ARCHITECTURE After the performance evaluation of architecture 3, it is observed that even though it is best suited to the current needs and hardware available for the project. The performance is the worst and is not feasible for operational use. Therefore an optimized solution was design to enhance the performance of the architecture. The optimization required the development of a new component the Instance Management Agent and changes to the transfer component of OpenNebula. INSTANCE MANAGEMENT AGENT The agent will be installed in every worker node and its main role was create a local back of the most frequently used base images in their own local data store and create ready to use base image clones. 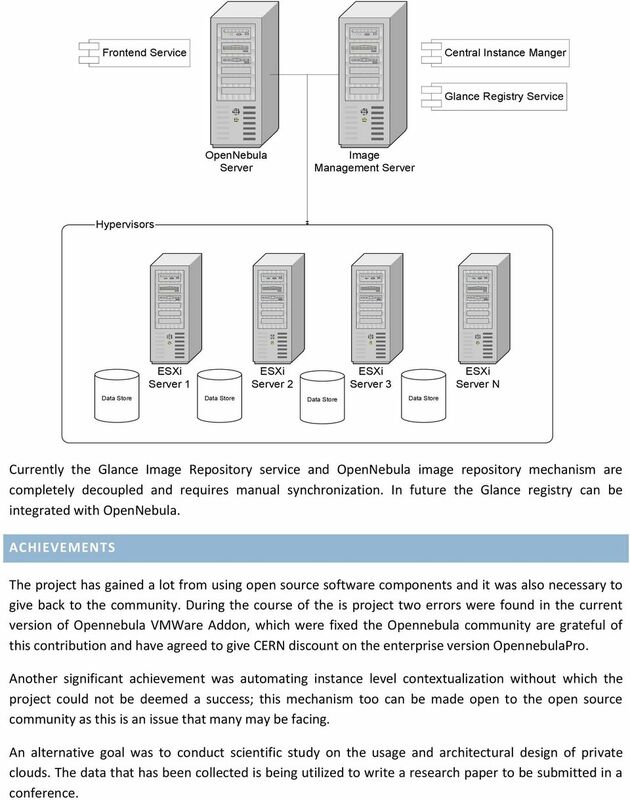 But the agent required a more sophisticated image repository, which is why it was decided to use OpenStack Glance image repository. 14 data and there is no single point of failure. If any of the worker nodes or frontend server fails it will not have any bearing on any other node in the system. The effect of failure is localized. Hypervisors Frontend Service Server 1 Server 2 Server 3 Data Store Data Store Data Store Data Store Server N OpenNebula Server Instance Manger Instance Manger Instance Manger Instance Manger AGGREGATED EVALUATION Comparing the performances of all the architectures with optimized solution shows increase in performance many folds, by pre cloning the virtual machines in a background process has not only improved on the previous minimum deployment time attained but also achieved our goal for deploying individual virtual machines under 15 minutes. 16 Every time the virtual machine is booted the script is launched by the OS. The script checks whether the instance is booted for the first time or the contextualization process was correctly executed by checking if the sysprep folder exists, if yes then it waits for the instance to complete other startup processes this is necessary as the script accesses an http server over the network and the Ethernet controller must be initialized. But as the there is no actual approach to verify network accessibility a failsafe mechanism is employed. After the wait state is over the script reads the configuration file which holds the URL of the http server where the mapping file is located, it consists of a key value pairs of MAC addresses and their corresponding hostnames. The configuration file also holds an optional parameter for host name prefix such as LABO-864- ; this prefix is added to the new host name. In the next step the script reads the MAC address assigned to the instance checks the availability of the http server and downloads the mapping file. If the server cannot be accessed then the failsafe mechanism is used the base image consists of a local mapping file. The script reads the mapping file for the correct host name and updates the sysprep ini file and launches the utility before exiting. The sysprep utility automatically reboots the system and runs a wizard to change the host name and add the instance to the CERN domain. AUTOMATED CLOUD SETUP The cloud infrastructure has many components as already mentioned above and configuring these components can take time. Therefore automating configuration was essential a bash script was developed to handle this process. The script has two steps. CONFIGURING CENTRAL STORAGE This step is optional depending on the architecture being used. The script creates necessary directories, users and sets correct accessibility rights. It installs Network File System service and automatically allows remote accessibility. CONFIGURING OPENNEBULA FRONTEND The setup installs the OpenNebula front end server, its dependencies and configuration and settings. This process has to sub steps Initial Configuration run as a privileged user and Installation run as OpenNebula user. FUTURE ENHANCEMENT The Distributed Storage with Instance Management Agent Architecture can further be improved the instance management agent has to be installed and managed on each server. This is achievable on a small scale cloud setup but does not scale when the cloud consists of hundreds of servers. In the enhanced architecture individual agents are no longer required; they are replaced by an instance manager which handles all the deployment of image backups on every server. The enhancement in the architecture allows the design to become scalable. 17 Frontend Service Central Instance Manger Glance Registry Service OpenNebula Server Image Management Server Hypervisors Server 1 Server 2 Server 3 Data Store Data Store Data Store Data Store Server N Currently the Glance Image Repository service and OpenNebula image repository mechanism are completely decoupled and requires manual synchronization. In future the Glance registry can be integrated with OpenNebula. ACHIEVEMENTS The project has gained a lot from using open source software components and it was also necessary to give back to the community. During the course of the is project two errors were found in the current version of Opennebula VMWare Addon, which were fixed the Opennebula community are grateful of this contribution and have agreed to give CERN discount on the enterprise version OpennebulaPro. Another significant achievement was automating instance level contextualization without which the project could not be deemed a success; this mechanism too can be made open to the open source community as this is an issue that many may be facing. An alternative goal was to conduct scientific study on the usage and architectural design of private clouds. The data that has been collected is being utilized to write a research paper to be submitted in a conference. 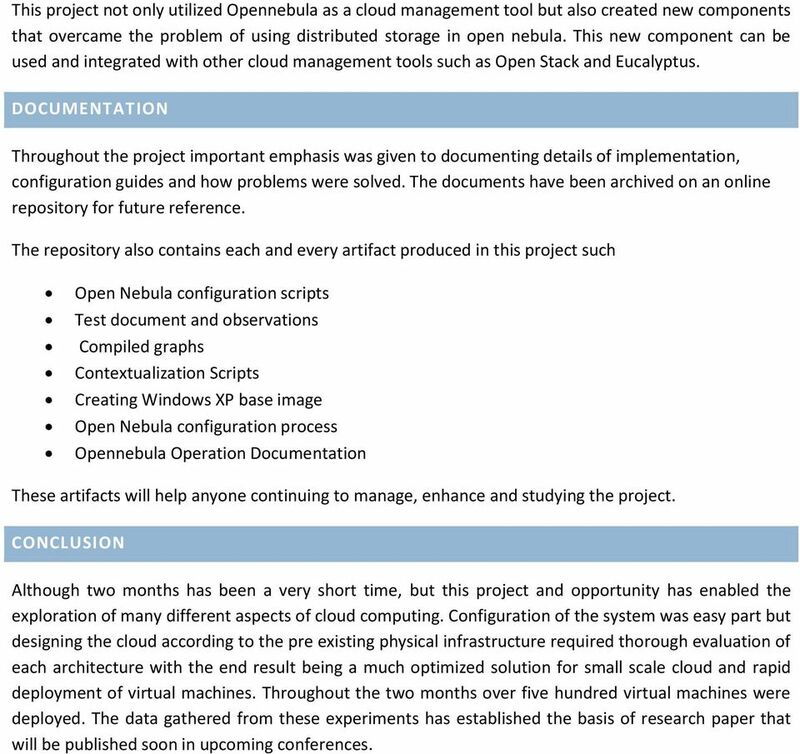 18 This project not only utilized Opennebula as a cloud management tool but also created new components that overcame the problem of using distributed storage in open nebula. This new component can be used and integrated with other cloud management tools such as Open Stack and Eucalyptus. DOCUMENTATION Throughout the project important emphasis was given to documenting details of implementation, configuration guides and how problems were solved. The documents have been archived on an online repository for future reference. The repository also contains each and every artifact produced in this project such Open Nebula configuration scripts Test document and observations Compiled graphs Contextualization Scripts Creating Windows XP base image Open Nebula configuration process Opennebula Operation Documentation These artifacts will help anyone continuing to manage, enhance and studying the project. CONCLUSION Although two months has been a very short time, but this project and opportunity has enabled the exploration of many different aspects of cloud computing. 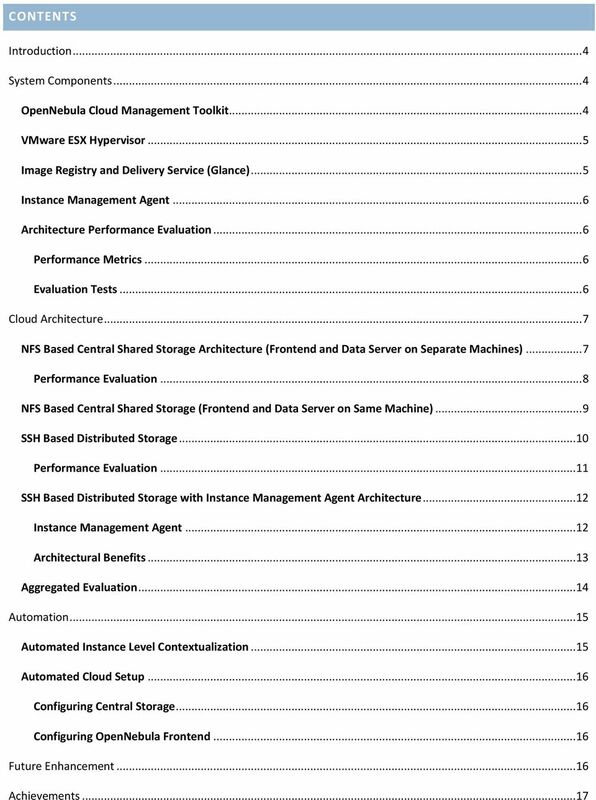 Configuration of the system was easy part but designing the cloud according to the pre existing physical infrastructure required thorough evaluation of each architecture with the end result being a much optimized solution for small scale cloud and rapid deployment of virtual machines. Throughout the two months over five hundred virtual machines were deployed. The data gathered from these experiments has established the basis of research paper that will be published soon in upcoming conferences. Why is a good idea to use OpenNebula in your VMware Infrastructure? Why is a good idea to use OpenNebula in your VMware Infrastructure? Constantino Vázquez C12G Labs Online Webinar OpenNebula in your VMware Infrastructure Contents Introduction Overview: What is OpenNebula?